The Lamp, symbolizing the light of wisdom, intellect and good works, has long been associated with higher education and illuminates the State of California. The lamp can also provide a gateway to another plan, as in the story of Aladdin. The Open Book represents literacy, scholarship and learning. It also symbolizes the passing down of knowledge to future generations. The Latin phrase “DISCERE FACIENDO” represents Cal Poly’s mission (“Learn by Doing”). The Binary System signifies the fundamental information technology that binds all of Cal Poly’s academic disciplines to one another and to the rest of the world. It also repeats Cal Poly’s founding date (1901). 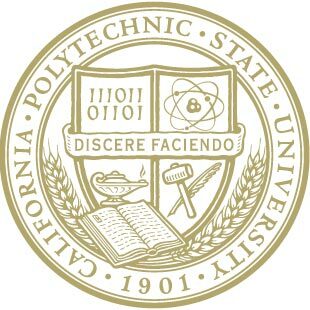 A stylized Atom depicts Cal Poly’s emphasis on the sciences as a basis for applied technology. Crossed Hammer and Quill Pen represents the balance of practice and theory inherent in Cal Poly’s educational philosophy. The Wheat Grain symbolizes Cal Poly’s origins and its continuing position as a national leader in agricultural education. The university seal is reserved for official administrative materials such as diplomas, certificates, transcripts and documents produced by the offices of the president and provost. To request permission to use the seal, email Creative Services at designsupport@calpoly.edu.